Statesville, North Carolina (March 20, 2018) – They say that sometimes a change can be good. 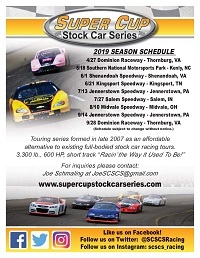 Many teams getting ready for the 2018 Super Cup Stock Car Series are putting that phrase into motion for various purposes. 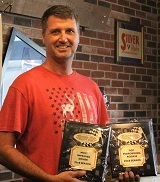 Kevin Kromer has been a fixture on the SCSCS circuit since nearly the beginning, but continues pushing toward the objective of upping his game and giving it another go to pursue the ultimate prize, s eries champion. The Walnutport, Pennsylvania driver underwent shoulder surgery during the winter months, but will be prepared come the season opening event at Dominion Raceway on Saturday, April 28. Due to the limited time available over the off-season, Kromer elected to switch to the car his son Kyle piloted over the last few years. Kyle Kromer will scale back to a limited schedule in 2018 in order to concentrate on his career after recently graduating from Police Academy. The two occurrences in which Kevin hopped behind the wheel of Kyle’s prior machine netted some impressive outcomes. 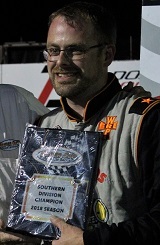 He claimed his only career pole award in the Columbus Motor Speedway swan song in 2016 and led laps in the most recent special event at Dominion. Kromer remains optimistic going back and found an interesting similarity related to the speed carried at the 4/10-mile Virginia facility. “The time you’re off the throttle and right back on it, I compare it to going from turn one to three at Pocono Raceway,” Kromer indicated. Kromer, now more than a year cancer free, will carry the Lehigh Valley Cancer Institute on his No. 77 car once again as well as the non-profit, Mission Racer, he and wife Kelly have started. The K2 Motorsports group is actively searching for opportunities to showcase the causes they are raising awareness for as well as seeking additional financial backing for 2018 and beyond. The Harrison family collectively is making a switch to a different fleet of racecars for 2018. Coming off a championship season, Harvey Harrison’s 2017 was not nearly as solid when it came to luck and performance on the track. The No. 51 was on three different cars throughout the season, all of which turned in decent finishes, but left him searching for more as he tries to become only the second ever repeat series champion. Harvey’s oldest son Brian had one of his best seasons in recent time, but still wants to find ongoing improvement in his and the team’s operation overall. While it will be the Renick, West Virginia family’s first time visiting Dominion, they have been working extremely hard at the shop and counting down the days. Additionally, they look forward to getting back to what has become their home track, Ona Speedway, in August where Brian started his racing career. Highest on Brian’s list is getting that still elusive first victory in the series, a moment that he has come very close to on multiple occasions. Nevertheless, he remains realistic about the possibilities. Others made a switch based on sheer necessity. 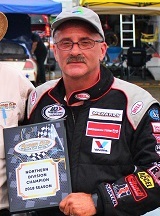 Ron Langdon came on board with the SCSCS at Jennerstown in July 2017 and out of the box scored a third place finish. Following that event, there were a share of small struggles, but part of the way through the last event at Dominion he hit on something. Unfortunately in racing, things can come to a standstill rather quickly. Rolling through turns one and two on a mid-race restart, Langdon acquired the fifth position and was as fast if not faster than the leaders. The next time around, trouble struck. His car got loose enough to veer head on into the turn four wall. Later on, they discovered it was a rear end locker that had stayed engaged. Now it’s back to the drawing board for the Freeport, New York veteran racer to tune a recently purchased ride to perhaps perform even better than the last one. That positive optimism mixed with hopefulness has the team ready to tow over from Long Island with their notable school bus and trailer. Scrimping and scrounging away after last year’s setback, Langdon is actively searching for additional support from a business or individuals to continue on after Dominion. Some cosmetic changes as well have Langdon hopeful that fortune can turn around. He will be switching to No. 17, a number he had always wanted but was always taken from the start of his career. The livery on the 2018 car will resemble his original paint scheme on a car he built and had a good amount of success with more than three decades ago - a car that is still racing locally today. Larry Wilcox turned in an eighth place result in the final 2017 standings with one top five and five top 10 finishes, but will be looking to build upon that performance. The Denver, North Carolina racer is more than likely going to try out a second car in his fleet, which has not competed since 2012, to see how it will execute. Although coming off some strong momentum, 2017 Top Performing Rookie and Dominion Non-Winners race champion Jerod Brougher has also decided to conduct some tweaks after a rocky first full year in the series. The Scottdale, Pennsylvania driver has a refreshed engine for 2018 and made custom removable front ends for their existing car. “We will be coming back this year with the same chassis but some Monte Carlo bumpers,” Brougher added. 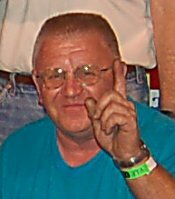 “We also picked up a new transmission off (former SCSCS competitor) Lou Ansel. 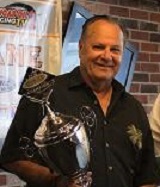 The motor came from Patsy Mignogna when his son Jason ran in the Pro Cup series. Brougher is also thrilled about getting back the No. 71 on the side and roof, a number which he drove to a championship in a local Four Cylinder Compacts class a few years ago along with wins in a Street Stock. They have a long way before all is complete, but the family team’s plan is to be at Dominion come late April. 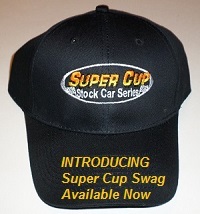 As the commencement of the new Super Cup Stock Car Series season gradually creeps closer, more information regarding the opening event will be available at www.supercupstockcarseries.com. Be sure to stop by Facebook and Twitter as well as the new Instagram page for continued and live updates and features. National television coverage of 2018 races will be featured for the third season in a row on MAVTV thanks to Sopwith Motorsports Productions and various supporters. At least the partial schedule is slated to be filmed with additional sponsorship opportunities still available for the remaining races to be showcased. Interested parties are encouraged to contact SCSCS Director of Competition Joe Schmaling at JoeSCSCS@gmail.com as soon as possible.